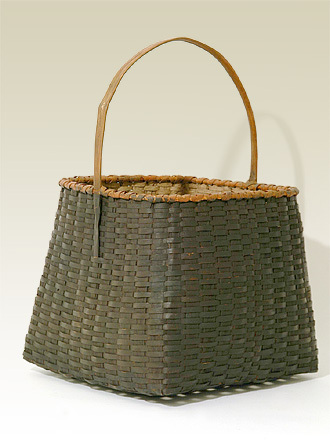 "This oversized carrier- style basket is, like all of my work, woven of black ash splint with rims and handle of shagbark hickory. The large size and tapered form of the piece lend a sculptural element to a very rugged, functional basket, great for blankets, magazines, yarns, etc." Similar baskets are available to order - also custom sizes.